If you happen to be a fan of Beyoncé then the chances are you would try and get tickets to one of her concerts if she was swinging by your way. The ex-Destiny’s Child singer has undoubtedly gone on to be one of the most successful female solo recording artists of all time. Plus, her marriage to hip-hop legend Jay-Z didn’t really do her worldwide appeal any damage. If you do manage to get to one of her concerts around the world then be prepared for her to not only belt out renditions of her pop infused tunes, but to also get up in your face and take your precious iPhone from you. If you’ve purchased tickets to a Beyoncé concert – probably at a very inflated cost – then there are plenty of things to keep you occupied. Song after song being thrashed out by Bey herself is obviously the reason you would be there. The show will also more than likely feature some pretty epic stage-lighting, various costume changes and a number of impromptu appearances from a variety of her fellow celebrity artists. What you don’t expect to find however, is a fan using the opportunity to make a FaceTime call to a friend or family member. So what happens when one of the world’s elite female recording artists catches you performing a FaceTime call during her gig? Does she get angry? Does she take it as an insult to her performance? It seems not. What actually happens is she struts over to you dressed from head-to-toe in a sequined body suit, takes the iPhone from your hands and carries on with the video call on your behalf. After chatting to the person on the other end of the call for a very brief period, Beyoncé handed the iOS device back to the owner and carried out doing what she does best. This recent episode is just the latest in the series of interactions that Jay-z’s beau has had with her audiences. She is fast getting a name for herself as one celebrity who is more than happy to engage with her legion of fans during her gigs. 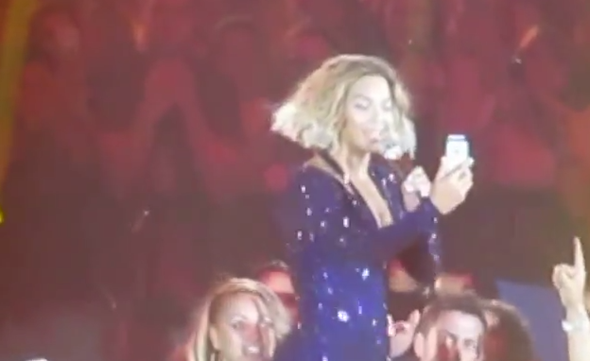 Still, we aren’t too sure that we would want Beyoncé grabbing one of our iPhones during a packed gig like that just in case AppleCare doesn’t cover any damage received.